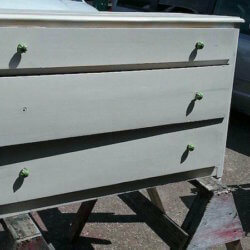 Recycled Rust will be opening the summer season at Holly Hill Art Farm on June 2nd & 3rd. That’s less than 2 weeks away! We are getting excited about our new creations and can’t wait to share them with you. Make your plans to join us. We’ll be there from 9 am – 4 pm on both days. 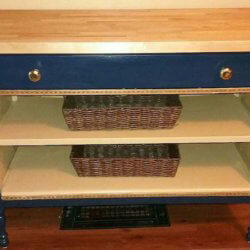 It is perfect as kitchen island, changing station, bar or entertainment center. The back of the island offers a useful chalkboard. Watch food safe sealer was applied to the butcher block top. Baskets provide storage. Perfectly sized at 50″ x 25″ and 41″ tall. $475. 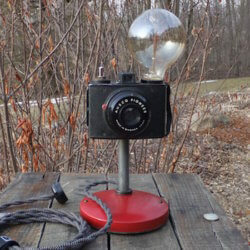 This retro style table lamp offers 40 watts of vintage lighting. 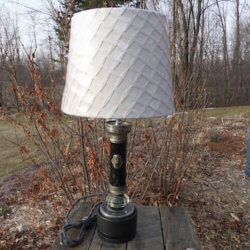 Industrial wheel, crystal door knob, chain saw parts & flash light meld into a table lamp. The soft side of industrial with a box pleat shade.